Add-ons can be updated without waiting for the upcoming release of gvSIG. Installation of gvSIG can be customized. Add-ons such as symbols, languages and script can be easily shared. Standard version. 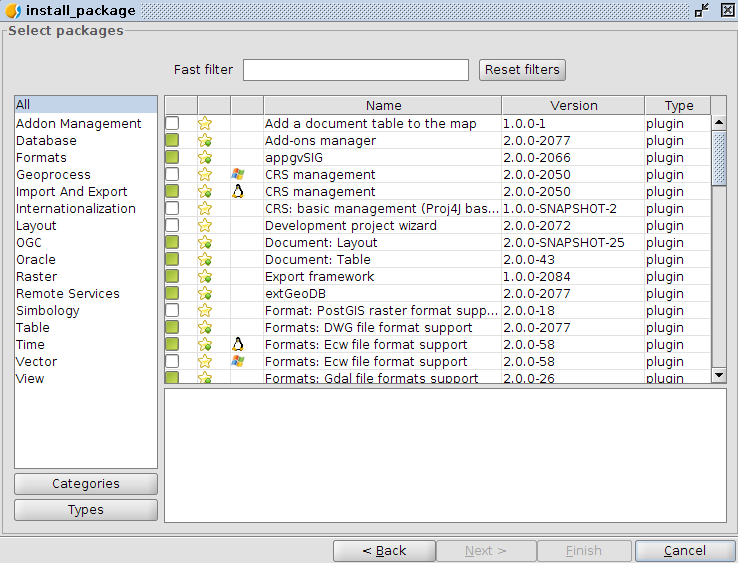 It contains the packages of the default setup plus a reduced number of add-ons. It corresponds to the release “All included version” of the download table. Online version. 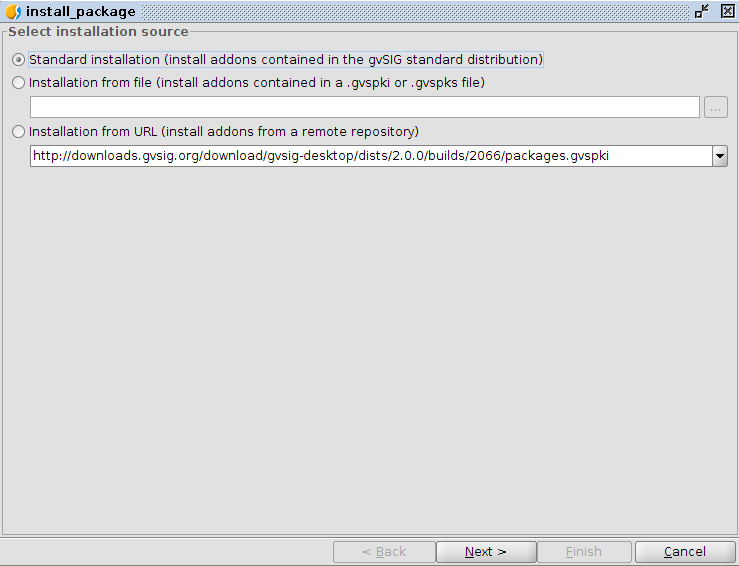 It contains basic and minimum gvSIG setup without any add-ons. To finalize the setup, an internet connection is needed. It corresponds to the release “with no extra software” of the download table. The Add-ons manager allows to modify the default setup by adding or deleting the default add-ons and to install or update add-ons later on. In this article we are going to explain how this tool works, assuming that gvSIG has already been installed. This option is available only if gvSIG has been setup from standard distribution, which allows to install only the add-ons already included; usually the most diffuse and stable add-ons are included. This option, thus, is the safer one because it should guarantee add-ons without fatal errors. No internet connection is needed during the installation procedure. The most evident advantage of this distribution is the possibility to install shared add-ons with another person even if they are not in the official gvSIG repository. It is useful even if you want to install an official add-on downloaded previously and individually. All the available add-ons for gvSIG version 2.0 can be browsed through this link . Through this option it is possible to view all the add-ons available in different repositories. The URL suggested by default refers to the repository of the installed distribution, containing all the release compatible add-ons, including the ones in development. Other URLs relate to generic official repository mirrors of the installed release (gvSIG 2.0 in this case) through which all the add-ons compatible with all the distributions of a given release we can download. This option is suggested if you want to test add-ons under development since all add-ons are shown without any indication of the state of development. For the same reason it is not indicated to install to many add-ons all together, since one out of them could cause fatal errors. If add-ons are installed one by one, it is easier to identify and remove the add-ons causing problems. After selecting one of these three options, a list of add-ons appears containing both the ones already installed and the ones that can be installed according to the selected option. If the add-on is already installed (green), or not (white). The already installed add-ons can be installed again except if they are checked with the white symbol. If the add-on is official or suggested. The compatible operating system in case the add-on is only compatible with one specific. Release. Useful if there is more than one available release of the same add-on. Type. Only two types exist so far (plug-in and symbols) but other, such as languages, icons and so on, will be added in the future. To make the add-ons search easier, it is possible to filter by category or type (on the left of the window) and by text (upper part of the window). Once the desired add-on has been selected, a new window appears, where the setup procedure can be monitored. At the end, the system will ask a restart to apply the changes.